The VCU Bulletin is published yearly for each of the student populations (undergraduate, graduate and professional) served by the institution. The bulletins contain information about university policies, course descriptions and academic requirements for the programs offered to these respective student populations. 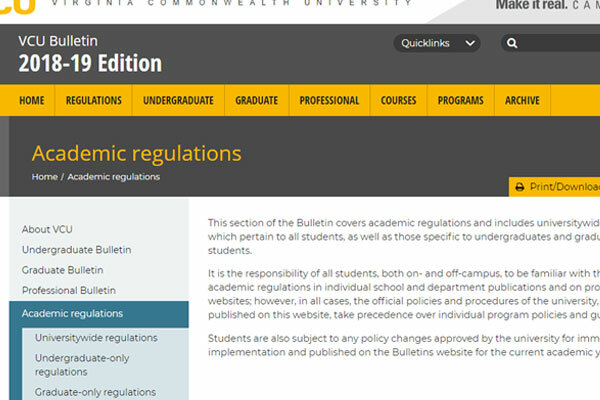 Academic regulations are also covered in the bulletin, including universitywide regulations, undergraduate regulations and graduate regulations. VCU uses Courseleaf's Catalog (CAT) and Curriculum Inventory Management (CIM) platforms to manage its bulletin and curriculum activities, as well as SIS degree programs and undergraduate minors. To propose a new course/program/CIM code (or to request edits to an existing one), please use the appropriate link below. The following resources are part of VCU's CAT and CIM training materials. For more information, contact the VCU Bulletin editor at bulletin@vcu.edu.